The caravan of the 2018 FIFA World Cup will finally reach the last of 8 groups when Colombia takes on Japan in a group H encounter at the Mordova Arena on 19th June 2018. 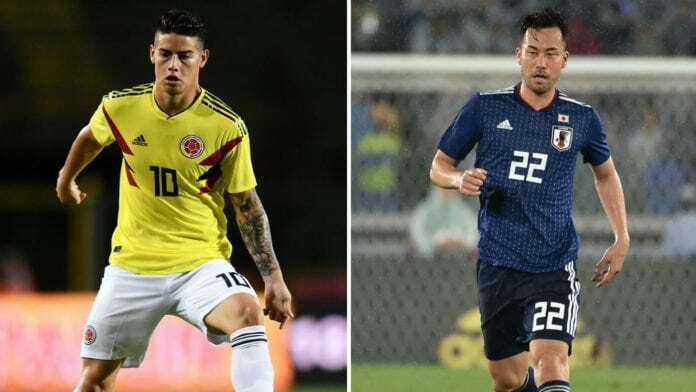 Despite Japan’s strong lineup, Colombia will start the game as favorites. The likes of Radamel Falcao and James Rodriguez will be carrying the responsibility of taking Colombia through to the knockout stages. Last time around, a young James Rodriguez hogged the limelight with his world-class finishing that saw Colombia finish 5th in Brazil. For Japan, the onus will be on the two Shinjis, Kagawa and Okazaki. Shinji Okazaki’s form for Leicester has certainly made him a key man for Japan at the 2018 FIFA World Cup. As for the fans are concerned, James Rodriguez creative flare is enough to draw their attention. His screamer against Uruguay at the 2014 FIFA World Cup in Brazil is still one of the best World Cup goals of all time, and the same could be expected of him this time around as well. Japan’s fan base would also be eager to see their side open their campaign at the 2018 FIFA World Cup in Russia. Poland and Senegal being the other two sides, Colombia can be considered as the favorites from the group with Japan and Poland battling it out for the second spot. That said, this game becomes a crucial one because of the crucial three points up for grabs. To ensure no fan misses out any action from this all-important game, we’ve got this little guide ready covering everything from schedule to live stream that will help you stay ahead of your busy calendar. Per Agence France-Presse (h/t Firstpost), Colombia’s James Rodriguez and Wilmar Barrios are both doubts for the match due to muscle fatigue, and the former missed training on Friday as a result. Colombia striker Carlos Bacca said “both have a little muscle fatigue but that’s normal with the amount of work that has been done since we left Bogota” a month ago, though AFP added manager Jose Pekerman is said to be considering using Juan Quintero in Rodriguez’s place if he isn’t fit enough to start. Per Transfermarkt, Japan appear to be injury-free and should have a full squad to call upon. Fans can enjoy the game between Colombia and Japan on their choice of devices as a large number of live stream options will be available for them. All the official broadcasters, FOX Sports, beIN Sports, Sony, BBC, ITV, DirecTV, Canal+, Sky, and others will be having a live stream channel that will stream the complete match between Colombia and Japan. While FOX Sports will stream the match on its live stream channel entirely dedicated to the 2018 FIFA World Cup, beIN Sports and Sony will be live streaming the game via both their websites and apps. beIN Sports is expected to serve the most number of viewers as fans from the MENA countries will have it as the solo broadcasters. Fans from countries where no official broadcast is available can opt for the VPN Gateways available on the internet. Also, another option for live streaming the match are the cable replacements, Sticky Bundles. Fans can choose from amongst some top names like fuboTV, DirecTV, PlayStation Vue, or Sling TV and enjoy the game without any fuss. The group H encounter between Colombia and Japan will be played at the Mordovia Arena on 19th June 2018 from 15:00 local time. The venue, Mordovia Arena, is still under construction but is expected to get ready just in time for the big event. It will have a seating capacity of around 44,442 and will host the home games for Russian Premier League side FC Mordovia Saransk replacing their old home, the Start Stadium. The most significant concern for the Colombian side will be the fitness of their key man, Juan Cuadrado, who is likely to return by April first week. While Colombia has got some pro campaigners, Japan has just enough power for expecting a turnaround. Shinji Kagawa and Shinji Okazaki will have a lot to prove against their strongest opponents on paper at the 2018 FIFA World Cup. With all the injuries and axing considered, here is how the playing XI may look like for both the sides. The Colombian fans will be able to catch all the action through their official broadcasters, DirecTV. Along with Colombia, DirecTV will also be broadcasting the Colombia Japan game in most of the Caribbean countries. For Japan, the game will be televised on TBS, along with a few other channels that include Fuji TV, NHK, NTV, TV Asahi, and TV Tokyo. Fans from the Asian Subcontinent would be able to catch all the action from the Columbia Japan game through Sony’s channels. Similarly, for the American fans, FOX Sports will be broadcasting the match, for the MENA fans, beIN Sports, for the fans fro the UK, BBC and ITV, for the African fans, Canal+, and for the host nation, Perviy Kanal. All the official broadcasts will have a 2-hour preview show that will include previews for the other two games to be played on the same day between Poland and Senegal and Russia and Egypt as well. Fans can enjoy the 2018 FIFA World Cup easily as all the official broadcasters will be giving in their everything to make the coverage better and better. Given Japan’s inconsistency in the recent past, it looks most likely a three-pointer for the Colombians. The best Japan can hope for is a draw, but that too seems least likely as their defense has looked pretty mediocre against strong sides. That said, the front force of Colombia has been in delicate touch which gives Colombia an extra edge over their opponents. Our prediction for the final scoreline is Colombia 2-0 Japan.